While researching for another Italian migrant, we bounced into this one married the same day as his compatriot we were working on. Cristino Stefani was born and baptized on June 26, 1832 in the parish of Santa Maria of Loppia in Tuscany. Like many boys of this part of the country, he learned how to make plaster figurines, "figure" in Italian, and would go peddling to sell them. So we were not surprised to read on the 1854 Loppia census that he was gone "alle figure". The census didn't say anything about his destination. Excerpt of the 1854 Loppia census. We had found one Cristino Stefani in Manchester, Vermont on the 1860 Federal census who was figurine manufacturer. He was enumerated with Michele Rigali, who we knew was born in Loppia and who became a well-known statue maker of Quebec city several years later. But on Stefani, at this point, we had no information other than his age, which is often wrong on censuses, and nationality. So the marriage found in Saint-Jean-sur-Richelieu, in the province of Quebec, was really a surprise to us. A good one though. Stefani arrived in Saint-Jean-d'Iberville, Canada during the course of the year 1861 most probably to work on the church extension project that started that same year. About a year later, on June 18, 1862, Cristino Stefani, son of Domenico Stefani and Anna Michelini married Helen Landry, dauther of the late René Landry and Celeste Tremblay, in Saint-Jean-l'Evangeliste, the catholic church of Saint-Jean-d'Iberville. Excerpt of St-Jean-l'Evangeliste church civil record. The couple had three children, all born in St-Jean : Cristino Dominique born on April 14, 1863 who died a month later, on May 10; Etienne Alfred born on June 15, 1864 who died April 18, 1865; and Louis Floride born January 20, 1867. Helen Landry died on August 21, 1868 at the age of 23. She was buried two days later in the local cemetery. 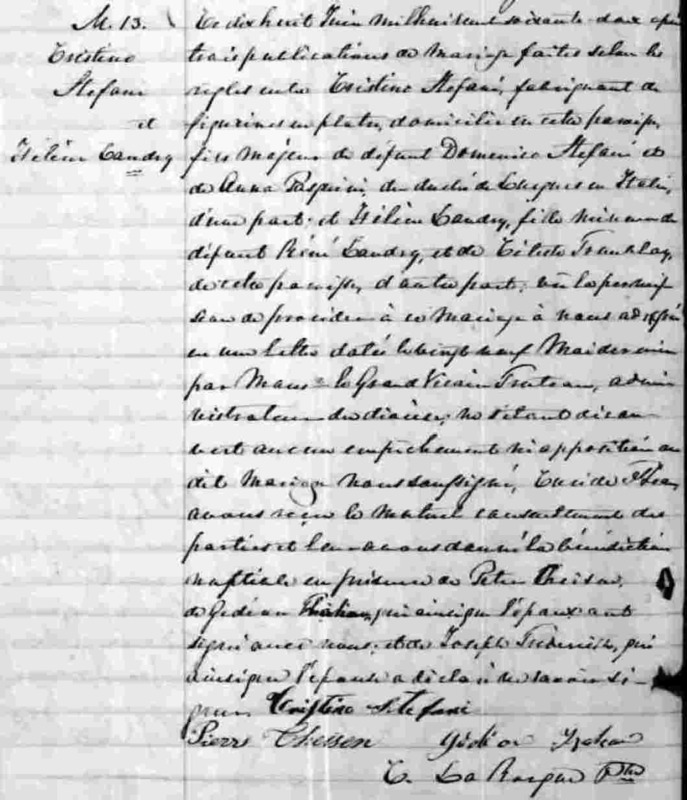 Cristino's second marriage, then a merchant of St-Jean, was to Josephine Lebeau, daughter of Joseph Lebeau and Seraphine Collet, on February 8, 1869. The couple had three daughters born in St-Jean: Marie Josephine, born on December 28, 1869; Clarinte "Corinne", born on August 1st, 1872; and Albertine, born on October 26, 1874. According to the 1911 Canadian census, he was still a merchant of St-Jean. We found him in the Lovell business directory of the province of Quebec as a grocer in 1906-1907. 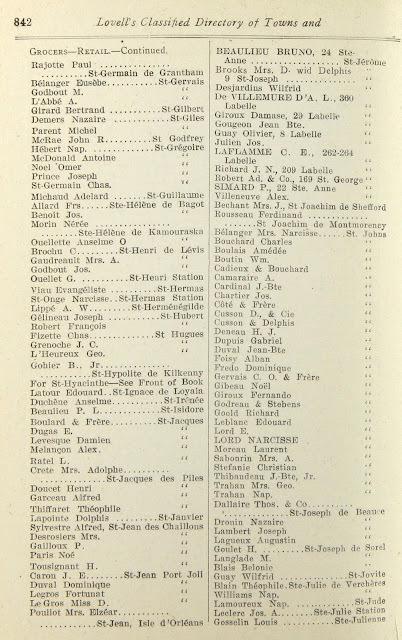 Page from the Lovell buisiness directory of the province of Quebec 1906-1907. The name Stefani became extinct since his son Florida had two daughters from his marriage with Marie Louise Dupuis in 1895. 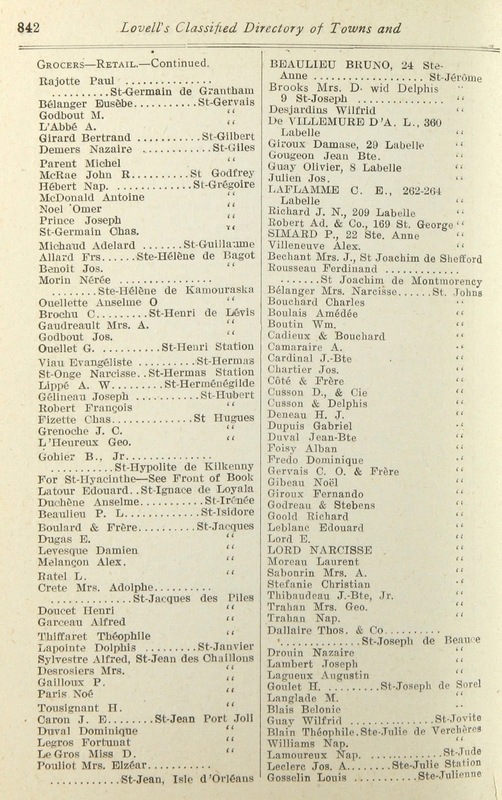 Marie married David Moore in 1887, Corinne, Joseph Emile Normandin in 1895 and Albertine, Louis Rémi Marien in 1899. Cristino Stefani died on July 24, 1911 in St-Jean and was buried in the local cemetery three days later.